Before the product is delivered to the market, it needs to be labeled to create its unique identity. With the utilization of labeling machinery, labels containing the brand name make the product easily identified and differentiated from the others. The physical attractiveness of the product increases its possibility of being sold. Labeling equipment is essentially needed in packaging industries as it makes the whole process a lot easier and faster, especially in applications that deals with bulky materials that are time consuming and tedious. There is specific type of labeling equipment for a certain packaging task; one can find several assortments in the market. Labeling machinery is classified into two kinds: Automatic and Semi-automatic. Some the most typical labeling machines commonly used are sticker labeling machines, self-adhesive, automatic front, wrap around sticker labeling machine and many more. Self-adhesive Labeling Machine – is mostly appreciated in labeling and attaching sticker labels around the surface of the any shapes of bottles with the help of heat. Side Labeling Machine – is best for attaching labels on both sides of the product (left and right). 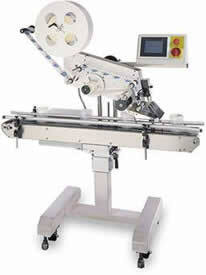 Back Front Labeling Machines – used for placing labels on the back and front facing sides of the product. Wrap around Sticker Labelers – is perfect for product that needs to be wrapped on all of its sides. Top side Labeling Machine – labeled only the topmost part of the product. Though semi-automatic labeling machinery can be purchased in a more convenient price, fully automatic labeling machinery is still much preferred in many manufacturing industries. Aside from the fact that it can do the job on its own without any assistance or operator, it’s also very efficient and productive compared to the semi-automatic labelers.